Works by two artists who made the ocean their muse were the focus of a small collection at Bearnes Hampton & Littlewood (21% buyer’s premium) on January 29. Coastal waves breaking in sunlight, sailing ship on the horizon by Julius Olsson – £4100 at Bearnes Hampton & Littlewood. The privately consigned group offered in the Exeter auction featured a trio of oils by the Anglo-Swedish painter Julius Olsson (1864-1942) and another by his student Robert Borlase Smart (1881-1947). The self-taught Olsson set up his studio on Porthmeor beach in St Ives in Cornwall, which later became the premises for a landscape and marine painting school in 1895. 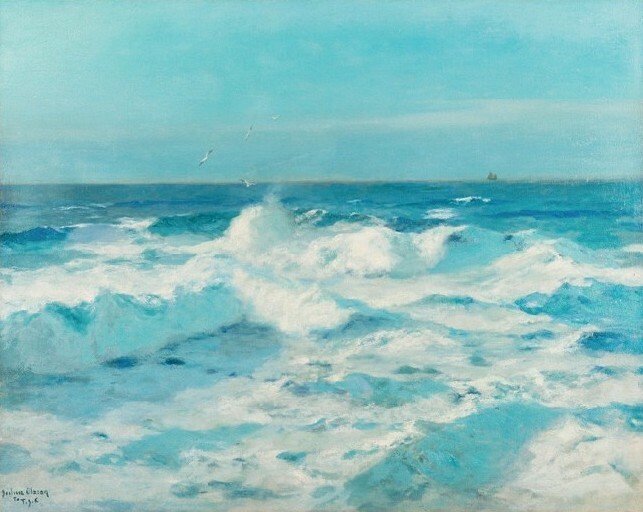 There he painted the seas and later made frequent painting trips to Ireland and Sweden, concentrating on the effects of light on water, which he viewed as a type of natural canvas. Olsson died near Dublin in 1942, having been bombed out of his London studio. The pick of the Olsson oils was a bright work of coastal waves breaking in sunlight. The signed 2ft x 2ft 5in (60 x 74cm) oil on canvas sold to a private buyer for £4100, over three times the top guide. Against competition from the same underbidder, a similar-sized moonlit scene of waves breaking on a rocky shore by Olsson’s student Smart sold to a different private buyer for a multi-estimate £3100. “The good prices were the direct result of strong demand from private buyers, not to mention that they were dramatic and impressive paintings too,” said BHL’s picture specialist Daniel Goddard. Originally from Devon, Smart moved to St Ives in 1913 to study seascape and later became a founding member of the St Ives School. In 2016, Sotheby’s sale of David Bowie’s collection of Modern British pictures included a view of St Ives by Smart that sold for a significant auction record for the artist at £32,500 (with premium).